The Japanese surgeon who gifted the Nigerian Olympic football team nearly $400,000 said they would have received the money even if they didn't win a medal. Katsuya Takasu said he was so taken with the spirit of the Nigerian side that he planned to give each player $10,000 even if they failed to win a medal in Rio. He told CNN: "I didn't tell anybody. I didn't want to diminish the morale and I told them you have to win." Takasu said he wept after Nigeria won the bronze match against Honduras in Mineirão on Saturday. "Although it was a close game all the way till the end. I was so happy and cried for their winning. Japanese are sentimental," he told CNN with a laugh. The plastic surgeon said he was impressed by their resilience after they emerged victorious in the Olympic football group stage, despite being stranded at the airport in Atlanta due to inadequate transport preparations. They arrived in Rio just seven hours before their opening match against Japan-- which they won 5-4. 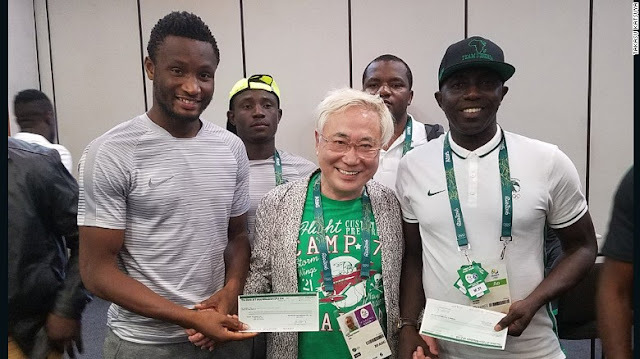 After the players received their medals last week, Takasu presented two checks amounting to $390,000 to their coach and captain, Samson Siasia and Mikel John Obi. "I've always wanted to help people who are bravely trying their best without any support," Takasu said. Takasu took to Twitter to promise he would reward the team after hearing about their payment woes. Nigeria's coach Siaisia was owed five months salary and the players threatened not take part in the quarterfinals after wrangles over allowances payments. He declared his support for the team and promised to give them $200,000 plus an additional $30,000 bonus to each player if they won gold. The surgeon who has been president of Japan Society of liposuction surgery since 1987 is known for his philanthropic acts. In 1995 when Japan experienced the Great Hanshin earthquake, which killed more than 6,000 people and injured thousands more, Takasu created a volunteer group of surgeons to carry out plastic and reconstructive treatment to the earthquake victims for free. But the payment has not been without controversy, some players accused the Nigerian Football Federation (NFF) of hijacking the money awarding process and demanded that the money should go directly to team members. The NFF president Amaju Pinnick took to Twitter to deny the allegations saying the money had to go through "integrity checks" before it could be released. He said: "Nigeria is a sovereign nation and such a donation must go through a process. If we get the go-ahead, it will go directly to the team, to say NFF has 'hijacked' the money is outright mischief. "The checks must be concluded and we are given go-ahead to collect by government. Nobody has collected any money. "We have duly informed the Minister and integrity checks are on presently," he added.